A Tried & True Review, where I look back at old project and discuss how it's held up since I made it, both successes and closet rejects, in an attempt to show how my projects have stood the test of time and/or to learn from the mistakes of my yesterdays. I recently took a big bag of clothes, mostly handmade items, to a local consignment store and I thought, true to the spirit of the Tried and True Review, I'd take some time to share with you why I was ready to let them go. Also, if you're in the Portland (ME) area and want to grab something sewn or knitted by me, now's your chance! There's a lot of items there, so I'm going to break it into two parts. For now, let's take it from the top (of the pile)! Made/Age: March 2012, 3 years old. Fit: It's loose and tunic-y, which I think works better at a shirt length than a dress length for me. At least in this fabric, which was still a little stiff. Style/Materials: Beautiful chartreuse linen. I was short on fabric and cut the sleeves as long as I could, which ended being a weird length about 2 inches above my elbow. From pretty much the second wear, I planned on shortening the sleeves to a more flattering length, but I never did it and never did it and never did it. Don't get me wrong, I love my school house tunics (I have three more! ), but between the sleeve length and a color that's not my best color, this one was always my least favorite. Construction: This is one of two School House Tunics to have pleats added and the only one without the addition of a front closure. Final Verdict: If you don't fix something after several years of intending to, you probably don't like it that much. Made/Age: June 2012, 3 years old. Update: Fabric salvaged from skirt. Jacket rejected from consignment and off to Goodwill. Those shoes are also at the consignment store. 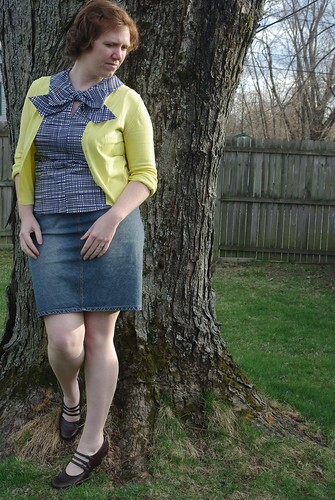 Fit: The skirt was too big and ill-fitting from the get go. I've always had trouble getting "pencil skirts" to fit right. This was just a big square of terrible. The jacket fit better, but was still very boxy. 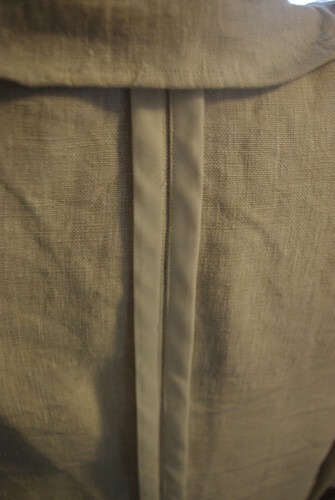 Style/Materials: Another beautiful linen. I love linen, but maybe I'm just not picking the right patterns for it. Separate or together, these pieces were just big, boxy and blah. It's the boxy that did it in. If it was nicely tailored and fitted it would have worked, but probably not in linen. My lady suit dreams will have to wait. At least I loved the shirt pattern in the pattern envelope. 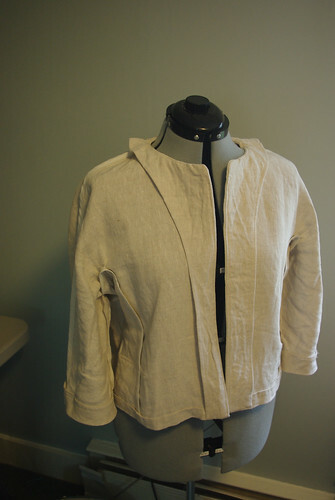 Construction: The jacket was fun to sew and I covered all the seams with bias tape. Final Verdict: Boxy just ain't my thang. Also, does anyone know of good patterns for linen? Fit: It's my own fault, but I cut it with too little ease. I tried letting our the seams where I could, but it wasn't enough. It pulls terribly at the bust. Style/Materials: A fabulous checked stretch shirting material. 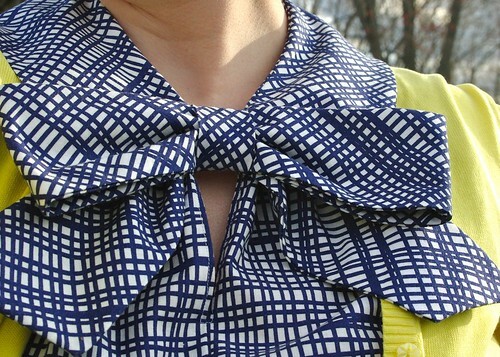 A bow blouse. Fun buttons! It so perfect for me, except that it doesn't fit me. This is the one item that really broke my heart to give away, but it truly, honestly, just doesn't fit right. Construction: Don't remember apart from the fact that I did the buttonholes horizontally, where I should have done them vertically along the button band. Final Verdict: Button up items need bust ease! But I should remake this at some point. That's it for this week. Next week I'll roundup the other 4 items. I'm a big Mad Men fan, but don't tell me anything about the current season, because I only get to watch it when the dvds come out, so we can chat about it in 4 months or so. In that vein, this post is appropriately a bit overdue. Back in Season 4, I grew very fond of the Dr. Faye character and I also fell in love with this skirted suit from the "Hand and Knees" episode. 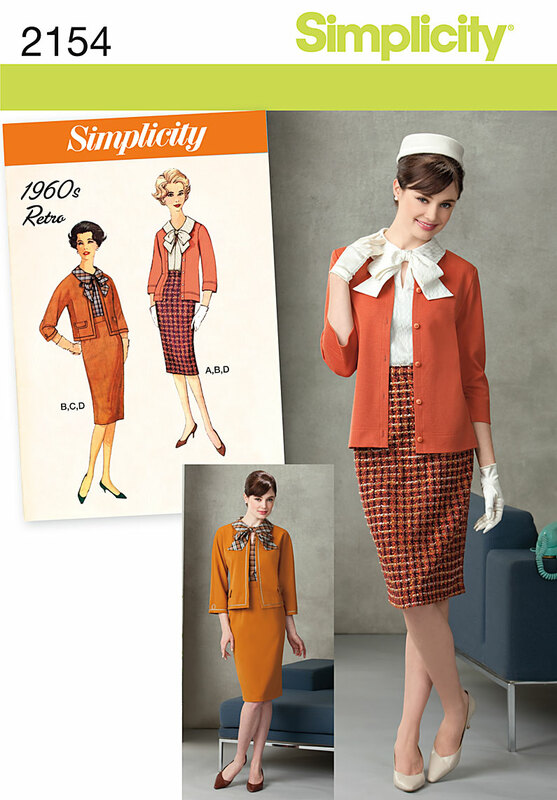 In some ways it seems more Banana Republic than 1960s, but then I found Simplicity 2154, a 1960's reproduction pattern and though, it's both! Recently finding myself in need of a warm-weather appropriate suit for my DC trip, I pulled out the pattern and several yards of heavyweight linen from Z Fabrics and put this together over a weekend. The coat is a fairly boxy design, which I decided was maybe not the most flattering on me, so it's belted in all these photos. Even if it's not the best cut for me, I believe the fit is spot on. If you wanted to slim it up some, I recommend narrowing the side gusset over choosing an allover smaller size. The jacket has a fun construction, with the front/back body and sleeve cut in a single piece, and an underarm gusset panel. Not counting the facings, the pattern in a total of 6 pieces. Attaching the top of the gusset to the underarm of the sleeve was a bit fiddly, but otherwise the jacket was very easy to sew. I actually had more issues with the pencil skirt (fitting ugh!). Because the jacket is unlined, I finished all the seams with either purchased bias tape (about 2 packages) or by self-hemming after I ran out of bias tape for the facings and underarm. I don't often need to wear a suit, but with a lady suit like this in my wardrobe, I might find a few more excuses! Not this weekend, but the one before, I squeezed in some time to sew, and churned out this blouse, which I decided I also need to make in a swiss dot someday. 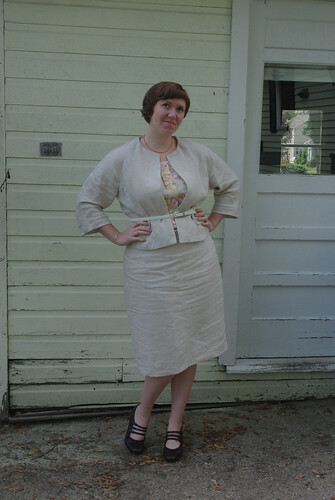 The pattern is the 1960's reproduction pattern Simplicity 2154, and I even bought a bunch of yardage of linen to make the rest of the suit (which strangely enough, about the same number of total pieces that this blouse). I love the fabric, which is a sturdy cotton from Lotta Jansdotter's line that I picked up at Z Fabrics. 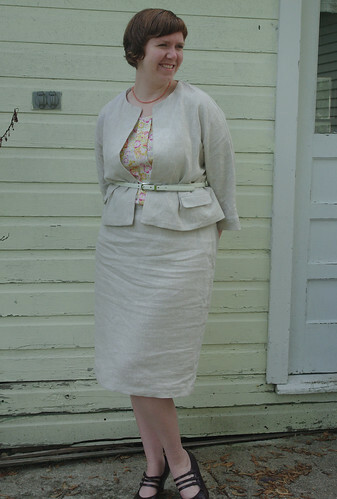 My only two mods to the pattern were extremely minor: 1) I decreased the seam allowance along the hips, and 2) I did the "Mena Test" of Sew Weekly fame and omitted the side zipper. 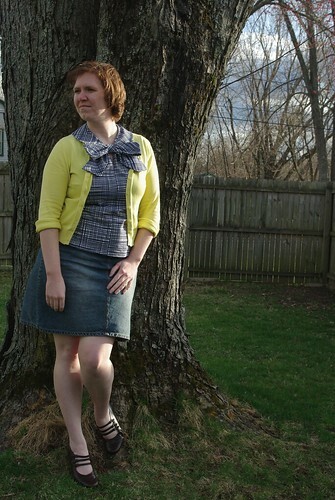 The top is sleeveless, but it was way too cold/windy to bare arms on the day I took these photos, but they're finished off nicely with some bias binding. The whole thing is pretty simple to sew and I can't get over how nicely the collar lies. Yep, I definitely need at least one more of these!